There’s been a lot of confusion recently surrounding the whereabouts of the Nougat update for the Galaxy S6 and Galaxy S6 edge. 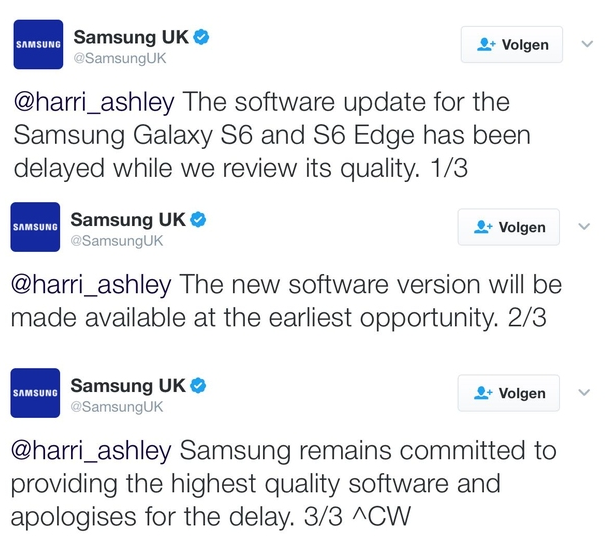 However, Samsung’s subsidiary in the UK has now taken to its Twitter account to reveal that the upgrade has been delayed while the firm reviews the quality of the firmware. Unfortunately, it remains unclear when the OTA will start making the rounds. The representative merely stated that it’ll be made available at the earliest opportunity. At least we know it’s still on the way, though — so Galaxy S6 and Galaxy S6 edge owners will need to have a little more patience. i agree.. we always take android versions late.. like marshmallow.. i really bored of that. i wont buy a new samsung i think. My opinions are begin to change..
What does it mean 2/3,3/3 or 1/2? it might be possible bcoz when lollipop got released for s5 and s4. Why did you post this old tweet? This post is from 27th February. So the beta app, has started to work again. I STOP YOU ! This tweet has been written on February 27th ! The date has been delayed to March 6th ! Be intelligent and don’t hide dates !! Next year you are waiting for android 8 for s7 like today!! In other news, the Note5 is supposed to get Nougat today. $100 it won’t come today. Its like the joke for S6 that would get it on 27/2…. Why’re you guys posting this today? This tweet is from six days ago. To make us buy a new Device!! !